Virat Kohli, a colossal name of Indian cricket recently has been the talk of the town. His recent achievement has attracted everyone’s attention. Simply put, there is no match for Virat Kohli’s supremacy in world cricket. He has been unstoppable throughout the ongoing bilateral series against Proteas. 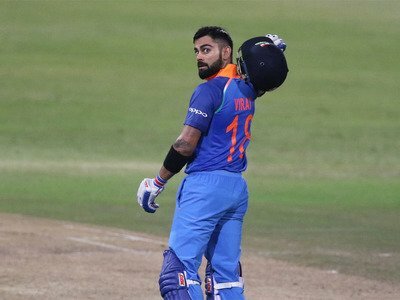 On Friday, in the sixth ODI between India and South Africa, Virat notched his 35th ODI ton and third of the series. That helped India post a comfortable eight-wicket win over the Proteas. And it is needless to mention that Virat broke a host of records during his innings of 129. In the six-match series, Kohli amassed a total of 558 runs averaging 186. But this is not the end of the story my friends, there are much more awaiting your attention. Became the highest scoring batsman in a bilateral series surpassing Rohit Sharma’s 491 against Australia in 6 matches in 2013/14 season. Became the highest scoring captain surpassing George Bailey’s 478 against India in 2013/14. Scored his 56th International century and became the 5th most prolific century-maker in international cricket behind Sachin Tendulkar (100), Ricky Ponting (71), Kumar Sangakkara (63) & Jaques Kallis (62). Became the 1st Indian captain to win a bilateral ODI series in South Africa. Became the highest scoring player in a bilateral series against South Africa in South Africa. He scored 558 runs surpassing Kevin Pietersen’s 454. He is also tied with Kevin Pietersen’s 3 centuries against South Africa in South Africa, in a bilateral series. And if you consider the last match into the discussion then chasing a target of 205 was made to look like a walk in the park. All thanks to skipper Kohli who walked off unbeaten on 129 off 96 balls with 19 boundaries and 2 sixes. The Indian skipper has simply been at his brutal best. From the findings of boundaries with relative ease and stitching to the first, a 61-run partnership with Shikhar Dhawan (18) and then an unbeaten 121-run partnership with Ajinkya Rahane (34*), he made a significant mark in the world cricket. India lost Rohit Sharma (15) early. And at one moment it did seem as if we might finally have a contest in our hands. But Kohli came up with a different mindset. He went hard upfront on the weakened South African bowling, who were without their star pacer Kagiso Rabada. Ngidi was the only shining light for the home team, picking up two wickets. Earlier, Shardul Thakur bowled a great spell of pace bowling as he scalped four wickets to help the visitors dismiss the Proteas for 204 in 46.5 overs. Jasprit Bumrah and Yuzvendra Chahal scalped two wickets each while Hardik Pandya and Kuldeep also picked one apiece.